In this article, we will discuss JDBC ResultSetMetaData Interface commonly used APIs with examples. ResultSetMetaData object that can be used to get information about the types and properties of the columns in a ResultSet object. ResultSet object rs creates the ResultSetMetaData object rsmd, and uses rsmd to find out how many columns rs has and whether the first column in rs can be used in a WHERE clause. String getCatalogName(int column) - Gets the designated column's table's catalog name. String getColumnClassName(int column) - Returns the fully-qualified name of the Java class whose instances are manufactured if the method ResultSet.getObject is called to retrieve a value from the column. int getColumnCount() - Returns the number of columns in this ResultSet object. String getColumnName(int column) - Get the designated column's name. int getColumnType(int column) - Retrieves the designated column's SQL type. 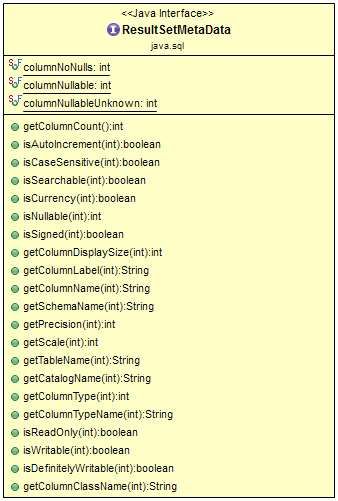 String getColumnTypeName(int column) - Retrieves the designated column's database-specific type name. int getPrecision(int column) - Get the designated column's specified column size. int getScale(int column) - Gets the designated column's number of digits to right of the decimal point. String getSchemaName(int column) - Get the designated column's table's schema. String getTableName(int column) - Gets the designated column's table name.